Hometown legend Frank Sinatra is still the pride of Hoboken, N.J., though the crooner had little use for the town (which he reportedly once called a "sewer") and headed west, to Southern California. After dying at age 82 in 1998, he was buried in a cemetery near Palm Springs, Calif., with a bottle of Jack Daniels and a pack of Camel cigarettes  two regular companions  tucked into his suit. Other eternal residents of the Desert Memorial Park include Sinatra's friends Sonny Bono and songwriter Jimmy Van Heusen, who helped pen such Ol' Blue Eyes hallmarks as "Love and Marriage" and "Come Fly with Me." 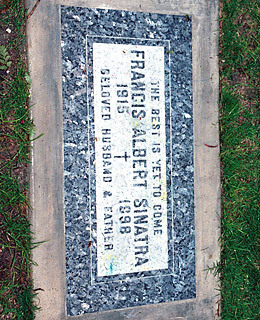 Lyrics from another classic are carved into his gravestone: "The best is yet to come." Read "Renting Frank Sinatra's House."